The winter months are long and punishing. As a homeowner, you spend a significant amount of money trying to keep your family warm. Heating and cooling adds up to half of your monthly energy bill. When overly-high energy costs and furnace malfunctions turn into a hassle you could do without, consider a new heating system. HVAC systems are more affordable then ever, especially when replacing an old system can drastically reduce your energy usage, and will eventually pay for itself. We offer everything you need to stay cool in the summer, from full system installation to seasonal maintenance agreements that protect your investment. Safeguard your home comfort with a cost-effective and simple maintenance agreement. As the seasons roll by, you'll avoid the inconvenience and stress of upkeep, tuning and keeping track of your system's service. When you leave the performance of your HVAC system to Michiana Heating & Air Conditioning, we monitor and take proactive steps to ensure integrity, reliability and efficiency of your equipment. Fewer repairs, extended lifespan, lower operational costs and the peace of mind of a well-maintained system are always assured. Family owned and operated, we are committed to client satisfaction, craftsmanship, education, quality equipment and trustworthy employees. We boast an expert staff of technicians who have the highest level knowledge of technology, products and installation practices that you will find locally. They bring a level of integrity to the job that matches our tradition of excellence in all aspects of customer service. 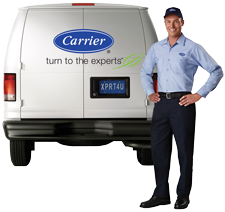 As a Carrier Factory Authorized Dealer, our team receives continued training and always installs Factory Authorized Parts when possible. Exceptional service and support, the most innovative technology, free estimates on replacements, and financing with approved credit make Michiana Heating & Air Conditioning the right choice. For solutions and assistance you can count on, call us at 574-807-6504. 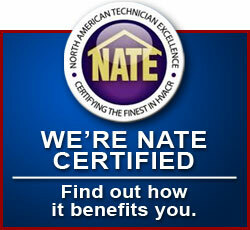 We take excellent care of local home and business owners throughout the Niles area, Indiana and Michigan. Michiana Heating & Air Conditioning is a Comfort24-7 Provider, guaranteeing 25% first-year energy savings. A new system that meets eligible efficiency levels will save you 25% in energy costs in the first twelve months or we will reimburse the difference between the calculated 25% savings and your actual savings. What this means is that if gas or electric energy costs, associated with operating your new heating and cooling system in the first year after installation, are not decreased by a minimum of 25%, when compared to the year prior, Michiana Heating & Air Conditioning will pay the difference. Michiana Heating & Air Conditioning creates the ideal climate for your home, answering every challenge of the seasonal weather changes. Toasty warm all winter, refreshing cool throughout summer – when our technicians handle precise temperature controls, you’ll enjoy energy efficiency, quiet operation and dependable performance. 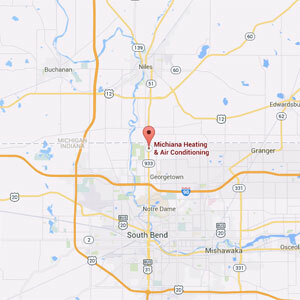 Michiana Heating & Air Conditioning is your trusted resource for all of your home comfort needs. From tailoring the perfect heating and cooling system installation to service and repair, we are confident we can exceed your expectations. We offer mini-split systems if you lack the necessary ductwork for forced air, but are looking for the comfort of efficient and reliable home cooling. Through the most advanced technology, convenient features and quality-crafted products on the market today, Michiana Heating & Air Conditioning rises to any challenge for home and commercial comfort. We offer free estimates on replacements and provide recommendations that will provide you with the perfect heating and cooling system that fits your budget, expectations, and needs of your family. 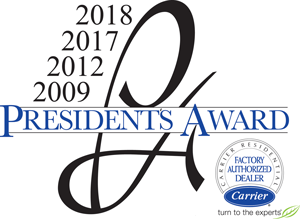 Michiana Heating & Air Conditioning Receives the 2019 President’s Award from Carrier, Earning Honors as Outstanding Dealer for the 3rd Year in a Row. Michiana Heating & Air Conditioning was recently named a recipient of the prestigious 2019 President’s Award from Carrier Corporation. The award provides recognition for outstanding dealers in the HVAC industry.